The following brief destination guide is presented to assist passengers with destination activities for this trip. Highlighted/underlined words contain hyperlinks; click on them for web sites with more complete information on that particular topic. Information contained here is believed to be correct, however please confirm hours, rates and availability prior to making plans for your specific date of travel. Our train will arrive at the intermodal Williamsburg Transportation Center (757/229-8750), located at 468 North Boundary Street. From there, it is an easy, level, ten- minute walk along Boundary Street to the west end of the Williamsburg downtown area and the Historic District. If you don’t wish to walk, taxi cabs are also based at the Transportation Center: Historic Taxi (tel. 757/258-7755), Williamsburg Taxi Service (tel. 757/254-2190), and Yellow Cab of Williamsburg (tel. 757/722-1111). The 1-mile-long-by-half-mile-wide restored Colonial Williamsburg Historic Area is at the center of Williamsburg (as shown in this map). The 99-foot-wide Duke of Gloucester Street is this area's principal east-west artery, with the Capitol Building at the eastern end and the Wren Building of the College of William and Mary at the west end. There you can experience the 18th century and even become an active participant. Purchase a Single Day Ticket to visit the historic buildings and gardens, the museums, Bassett Hall and take guided tours. This ticket gives you broad access to all 35 historic buildings and the use of the Colonial Williamsburg shuttle bus, which loops around the historic area every fifteen minutes. 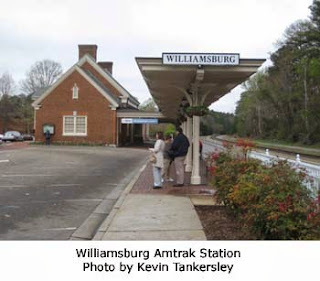 The most convenient Colonial Williamsburg Ticket Office is located in the west end of downtown Williamsburg at the intersection of Duke of Gloucester Street and Henry Streets (one block east of Boundary Street). 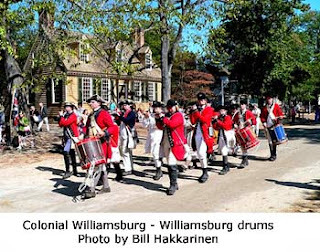 Other tickets, tours and passes are also available; see the Colonial Williamsburg web site for pricing and full details or call 800/447-8679 for more information. You have the option of walking the streets of the Colonial Williamsburg area without actually buying a ticket; you just won't be able to enter the gardens or buildings. A stroll through the town is quite enjoyable, and can be a photographer's dream! Art Museums of Colonial Williamsburg – A separate Museum Single Day Ticket (under Local Guest) may be purchased at the Colonial Williamsburg Ticket Office or directly at the museums for the Abby Aldrich Rockefeller Folk Art Museum and the DeWitt Wallace Decorative Arts Museum located at the Public Hospital of 1773 on 326 Francis St. between Nassau and South Henry Streets, and Bassett Hall at 522 Francis Street. This ticket includes the use of the Colonial Williamsburg shuttle bus. The museums are open daily and the hours vary seasonally. The Abby Aldrich Rockefeller Folk Art Museum is home to strong holdings in textiles, painted furniture, pottery, weathervanes, signboards, and a wide array of decorative useful wares created by talented, self-trained artists and craftsmen. For more information go to the FolkArt Museum web site or call 757/220-7724. The DeWitt Wallace Decorative Arts Museum is home to an extensive collection of American and British antiques. See furniture, metals, ceramics, glass, paintings, prints, firearms, and textiles from the 17th, 18th, and 19th centuries. For more information go to the Decorative Arts Museum web site or call 800/447-8679. Bassett Hall is a simple two-story 18th-century white frame farmhouse nestled on 585 acres of lawn, garden, and woodlands, Bassett Hall once was the Williamsburg home of John D. Rockefeller Jr. and his wife Abby Aldrich Rockefeller. The home is now open to the public and appears much as it did in the 1930s and 1940s when the Rockefellers made it their home. For more information go to the Bassett Hall web site or call 800/447-8679. The Bruton Parish Episcopal Church was built in 1707. You can sit in the pew where George Washington, Patrick Henry, Thomas Jefferson, George Mason, John Marshall, and many more sat on Sundays when they were in Williamsburg. The church bell, hanging in the bell tower, is a sister bell to the Liberty Bell. It is still rung every Sunday for church. The church is open from 10:00 to 4:30 PM, and admission is free (a donation of $1.00 per person is appreciated). For additional information go to the Bruton Parish Episcopal Church web site or call 757/229-2891. Lunch: There are a number of options for lunch in Williamsburg ranging from quick bites to full sit down meals. You can find a variety of options at Merchant’s Square and surrounding streets near the College of William and Mary. Online sources such as Yelp and the local Examiner Top Lunch Spots List are helpful. For Colonial flavor, consider the several Taverns operated by Colonial Williamsburg within the historic area. Reservations are recommended. For more information, see the Colonial Williamsburg Taverns web site or call 800/447-8679. Shopping: There is plenty of shopping to do in Williamsburg—there are a variety of stores in the Merchant’s Square area, as well as the Colonial Williamsburg shops in the Historic District. The Visit Williamsburg web site on shopping will give you an overview. If outlet shopping is your thing, the Williamsburg outlet stores are located six miles west of the city, requiring a taxi to get there and back to the train station. Getting Around Williamsburg: You may take the Williamsburg Trolley for a ride around town (route shown in this map) or the Colonial Williamsburg shuttle (tickets sold at Colonial Williamsburg Ticket Office) to move around the historic area. Our train arrives at the Newport News Amtrak Station, located at 9304 Warwick Boulevard in Newport News, VA. The station is approximately five miles from downtown Newport News. Taxis can frequently be found at the front of the station to take you to places nearby; Yellow Cab of Newport News 757/855-1111. Mariner’s Museum (www.marinersmuseum.org): The must see attraction in Newport News, is the Mariners’ Museum, a 7 minute taxi ride from the Amtrak Station. Designated by Congress as America’s National Maritime Museum, The Mariners’ Museum offers a captivating look at centuries of seafaring adventures. The dramatic USS Monitor Center brings to life the “Battle of the Ironclads,” and offers visitors the chance to walk the deck of a full-scale Monitor replica. Other treasures wait at this maritime gem. The world-class collection includes 35,000 maritime paintings, artifacts, figure heads, ship models, decorative arts and small craft from around the world. Shop for unique souvenirs in The Museum Shop and dine in the Compass Café. For additional information call 757/596-2222 or go to the Mariner’s Museum website. Huntington Park: Located just across Warwick Boulevard from the Amtrak Station, is Huntington Park, which has the Virginia War Museum, a rosegarden and a C&O Kanawha steam locomotive on display. Lunch: There are no restaurants in the immediate vicinity of the Amtrak Station, however there are a number of places in the nearby areas (beyond walking distance). See the Newport News Visitor Information restaurant web page for more information.